Quo are the most successful band in British history after the Beatles and the Rolling Stones. From 1973 to the mid-80s they had a string of hits, including 'Down, Down', 'Rockin' All Over the World', 'Again and Again', 'What You're Proposing' - all classic rock anthems. When the band imploded, and the other members left, Rossi and Parfitt reinvented Quo for the 90s and kept going, touring constantly and winning new fans. 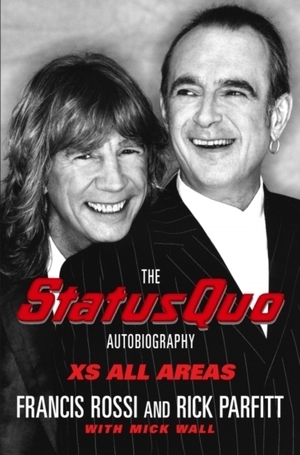 The story of Status Quo is essentially the story of two people: Francis Rossi and Rick Parfitt. It is the story of two outwardly very different characters - Rossi, the moody insecure one, Parfitt, the smiling, permanantly at ease golden boy - who against the odds forged an unlikely yet enduring bond that would see them through the dizzying highs and terrifying lows of a forty-year career. Rossi and Parfitt admit that in the past they've hidden some of the truth about their lives, unable to admit how out of control things were even to themselves. Now they tell it all - the drug-taking, the marriage breakdowns, Parfitt's brush with death when he was forced to undergo by-pass surgery. From their early days as a sixties 'boy band' through the massive international success of the seventies to the present day, this is an explosive no-holds-barred autobiography from two of Britain's most enduring rock stars.